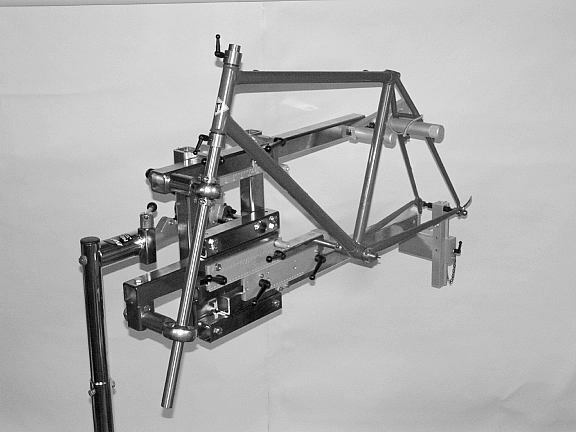 Bicycle frame jigs are used in production and hobbyist environments to assemble the tubes to build a frame. There are three jigs which are commercially sold for production work. The most common is the Anvil frame jig, followed by the Sputnik and Arctos. Then there are a couple jig examples I’ve located which are built from extruded aluminum by hobbyists. The following picture shows the Anvil Journeyman Type 3 available from www.anvilbikes.com. 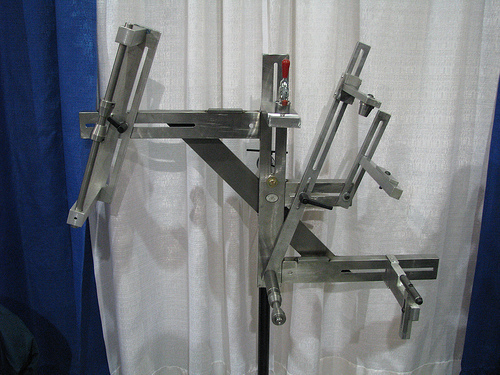 This is a picture of the Sputnik frame jig available from www.sputniktool.com. 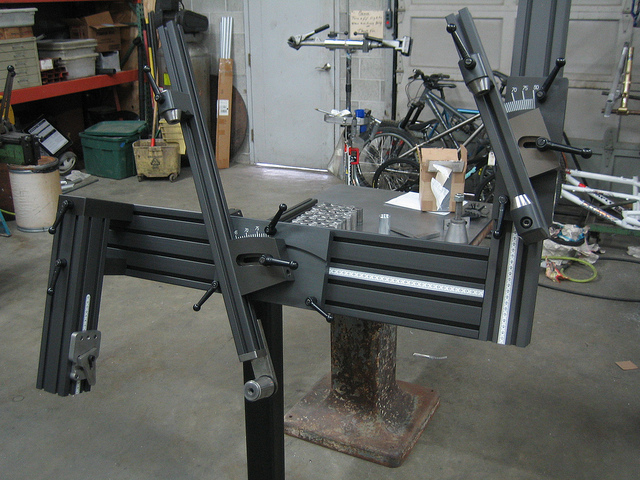 The following image is a picture of the Arctos frame jig available www.arctosjigs.com. 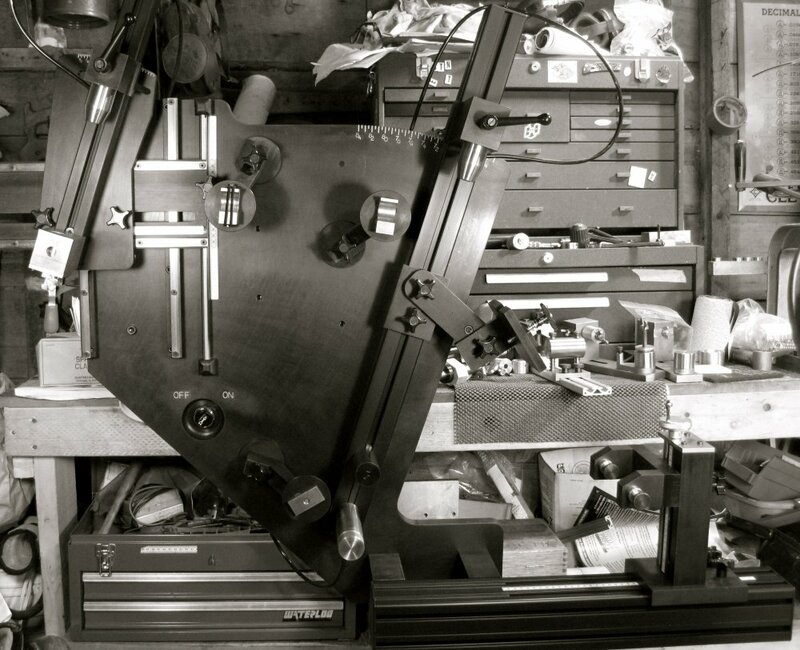 Another long time jig maker is Henry James based in Redondo Beach CA. 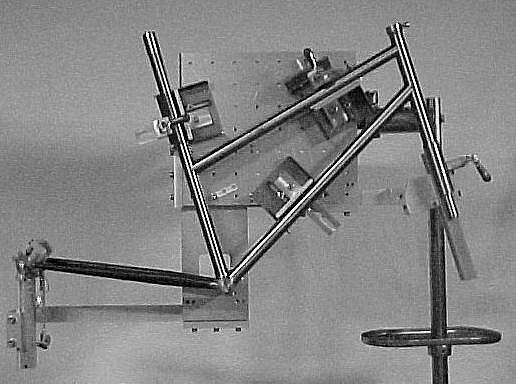 His original jig is the compact plate model shown below. In addition a series of lower cost jigs have been introduced under the Access label. There is a model 65 and 100. They are both functionally equivalent, one is just a bit heavier than the other for improved durability in a high production situation. 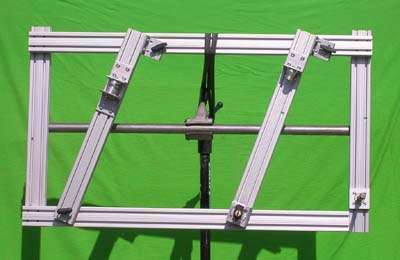 The Access jig is shown in the following picture. Finally, in the category of commercial jigs there is the Bringheli. It has a very attractive price of only $1350. In the realm of hobbyist built jigs the 8020 structural aluminum material is a popular choice. The Arctos jig above uses a similar type of extrusion, however, it is a specialty German made product with very high tolerances. General purpose hobby jigs don’t need to be so elaborate. Misumi USA has a wide selection of metric size structural aluminum extrusions for the builders who want to stick with metric dimensions. 8020 has an eBay store where they sell remnants of tubing at a discount for users who want to work with English units. 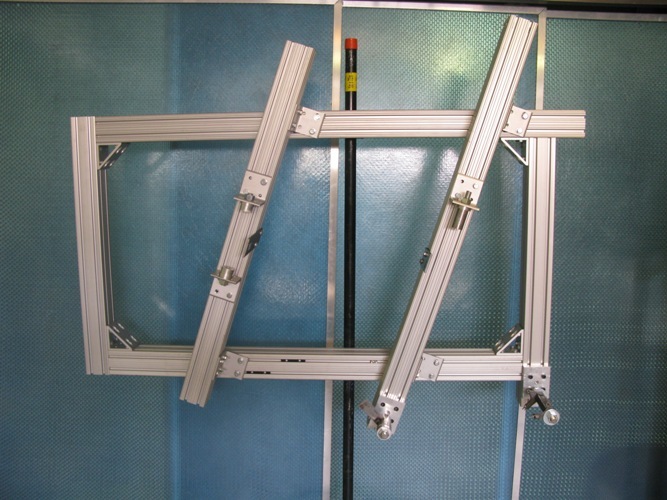 The following is a picture of a simple frame jig documented at Instructables.com. The plans are available at this link. They are quite detailed and the original designer often posts at http://www.mtbr.com in the frame building forum. Twomarrow bikes has a couple posts about jigs inspired by this 8020 design, documented at this link. Here is a picture of one of the 8020 jigs from Twomarrow bikes. A jig inspired by the Arctos design is documented at this link and shown in the picture below. I particularly like the Arctos design and I believe my personal engineering plans will be based on it using Misumi USA metric aluminum extrusions. 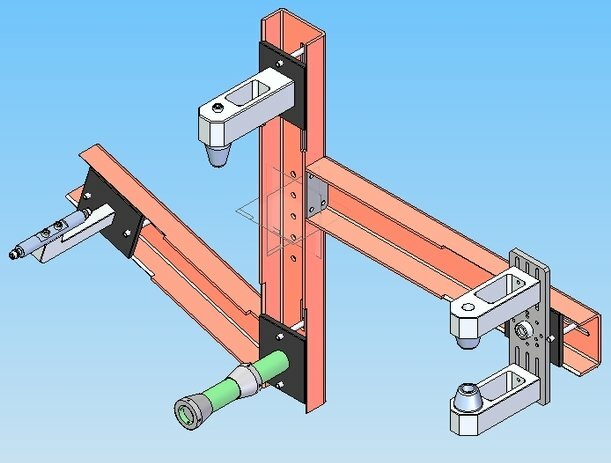 Finally, this jig design is available for download from GrabCAD at this link. 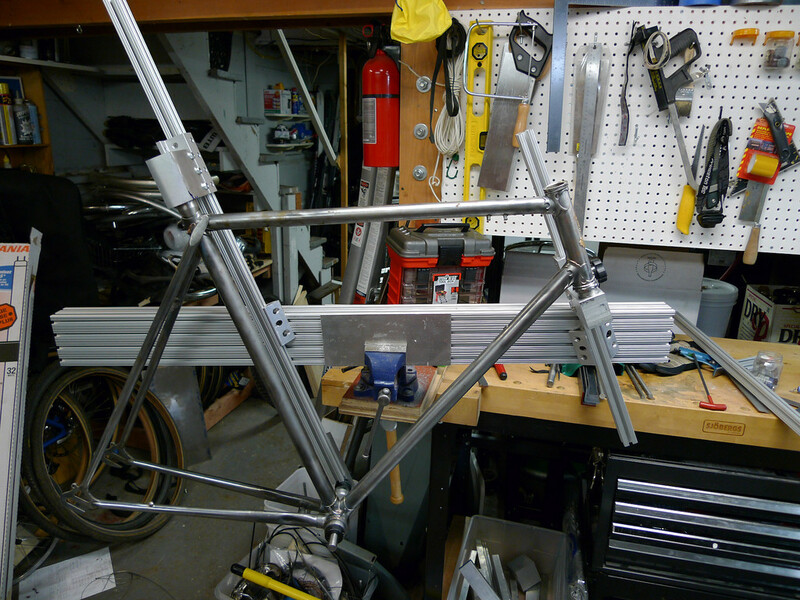 Indrek Narusk designed this jig along with some bike frames and parts. All of his CAD files are available for download from GrabCAD. This entry was posted in Bicycle Design and Fabrication. Bookmark the permalink. Thanks for the post. I’m just getting started building bikes and this is just what I needed. Good luck with your frame. Hey, thanks, I’ve got a bunch of these bookmarked all over the web but this is the best single resource I’ve come across. We’re making several jigs for bamboo bike production (finally got an order for more than one) and need a cheap accurate (+/-1.5mm) design.